FlangeLock™ Tools stop the mess! The FlangeLock™ tool consists of three parts: a sleeve, a plug, and a slug. The sleeve and plug screw together to temporarily plug a disconnected hose. The slug is used to plug the open port. Use flange halves (not included) to keep the slug in place. To seal the port and disconnected hose or tube, follow these easy steps. Choose the FlangeLock™ size - Code 61 (thin slug) or Code 62 (thick slug). Loosen the FlangeLock™ plug and remove the slug. Do not unscrew the plug all the way - just loosen it enough so the slug slips out. Your FlangeLok™ sleeve and plug assembly is now ready to be used. Next, loosen all four bolts of the flange that you are disconnecting. Remove one flange half completely (removing the top half works best), and then disconnect the hose or tube. To seal the port side, insert the slug in place of the removed hose or tube (O-ring goes toward the face of the port, duh). Reconnect the other flange half and tighten all four bolts to keep oil from spilling out. 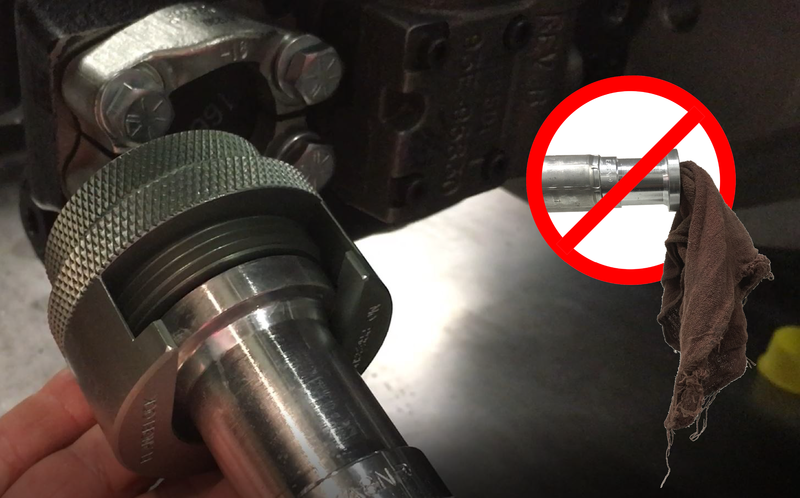 To seal the disconnected hose or tube, slip the sleeve and plug assembly over the flange and tighten the plug to seal. Reverse the process to reconnect. When removing the slug from the sleeve and plug assembly, do not unscrew the plug all the way from the sleeve. It will take longer to plug the flange, and you may end up spilling more oil. Loosening the cap just enough for the slug to slide out will ensure that you can slip the sleeve and plug assembly over the flange easily. After that, seal it with a couple of quick turns. There are just two things you need to pay attention to: the size of your connection (1/2"-2"), and the flange thickness (Code 61 or Code 62). FlangeLock™ sleeves and plugs are color-coded according to their size. The slugs are marked with their size and flange code. Should the marking wear off of the slug, just use the thinner slug for Code 61, and thicker slug for Code 62. Note that the color corresponds to size only, and the same sleeve and plug assembly works for both Code 61 and Code 62. The only exception is the 2" size where the sleeves and plugs differ between Code 61 and 62. FlangeLock™ tools can be purchased in kits or individually. Ready to buy or have a question? Email us.